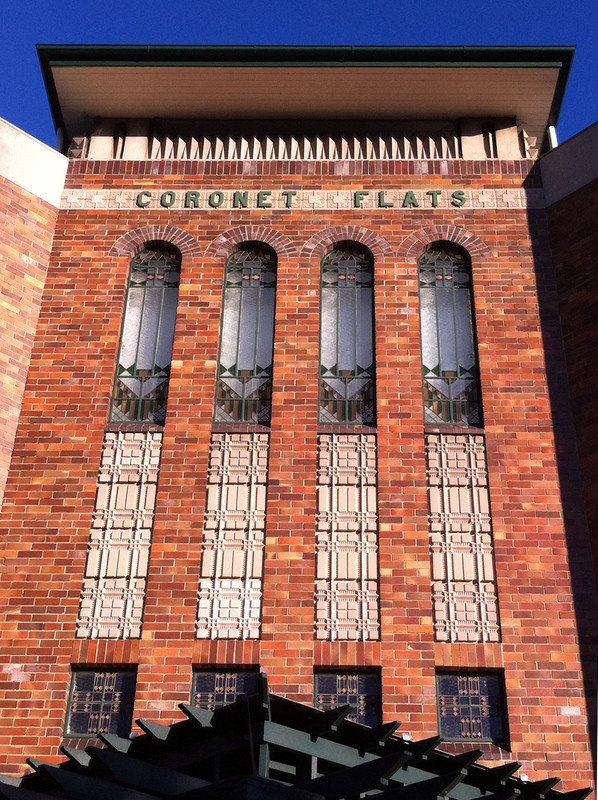 Regular visitors to popular New Farm Park will be familiar with Coronet Flats, one of Brisbane’s most renowned Art Deco landmarks. 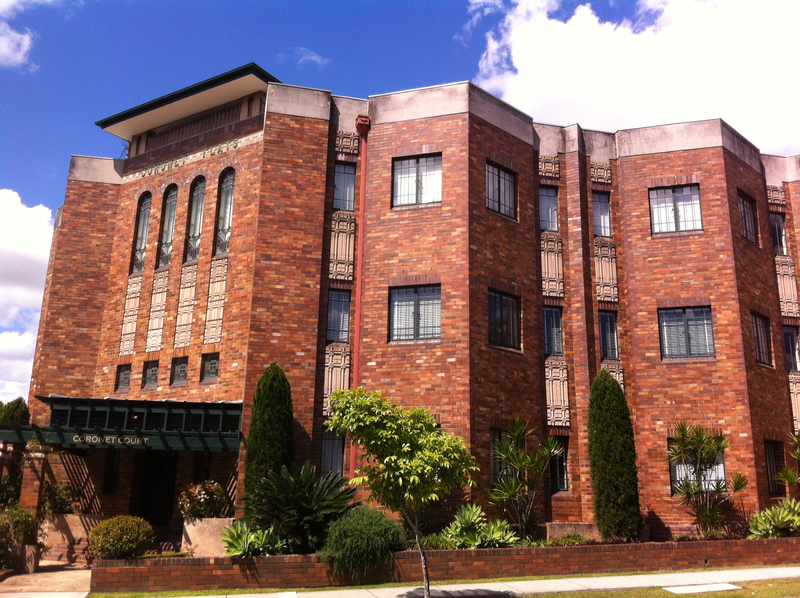 Many stories could no doubt be told of lives lived there, but the building itself also tells a story – about a European migrant travelling north who brought with him a penchant for apartment living and accelerated Queensland’s embrace of the Art Deco style. When constructed in 1933, Coronet Flats represented a bold step in Queensland’s experimentation with modern architecture. The Courier Mail, writing upon its completion, proclaimed that the architectural style defied description, yet at the same time praised the building for its arresting beauty and dignity. Leading the charge was German-born, Melbourne-based businessman and designer Max Strickland, who first moved to Brisbane on commission to complete the decorative plastering that adorned the Regent Theatre. Strickland quickly observed that Brisbane was lacking the kind of fashionable, inner-city serviced flats that were abundant in the southern capitals, and determined to fast-track the town into the age of modern living using land next door to his own Brunswick Street home. At an estimated cost of £9000, this was one of the largest residential developments in Brisbane for some years. In the throes of the Great Depression, it was an important building project that brought direct and indirect employment to local carpenters, manufacturers, designers and artisans and offered them an opportunity, in equal measure challenging and invigorating, to apply their skills to the new modern aesthetic. 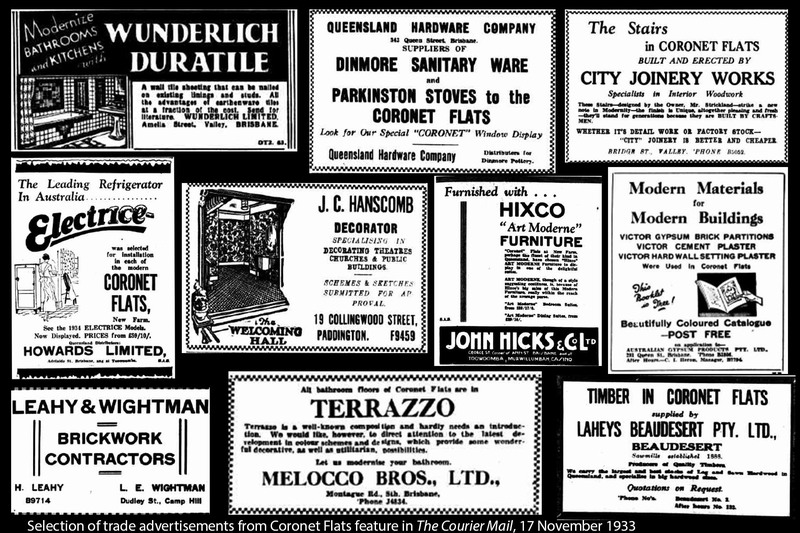 When the project was completed, a full-page feature in The Courier Mail was bordered by advertisements from local tradespeople eager to generate business on the back of their involvement. The fine craftsmanship of Leahy and Wightman was celebrated for bonding the building’s bricks with great precision. Max Strickland’s own company, Stucoid Modelling Co., took care of ceiling treatments and pressed cement work, while local decorator J.C. Hanscombe lent his artistic hand to finishing touches including the brick fireplaces adorned with native koalas.1 Supplies were sourced locally where possible, including bricks manufactured by Brisbane Brick and Builders’ Supply Co. and blue gum flooring from Laheys Beaudesert Ltd saw mill.2 Renowned tile manufacturer Wunderlich Ltd, also responsible for the exquisite detailing of the McWhirter’s facade in nearby Fortitude Valley, supplied tiles for Coronet Flats’ red tower roof. Queensland Hardware Company sensed the curiosity the project had aroused in Brisbane’s public and set up a special ‘Coronet window display’ at its Queen Street store to showcase the bathroom ware and stoves it supplied. 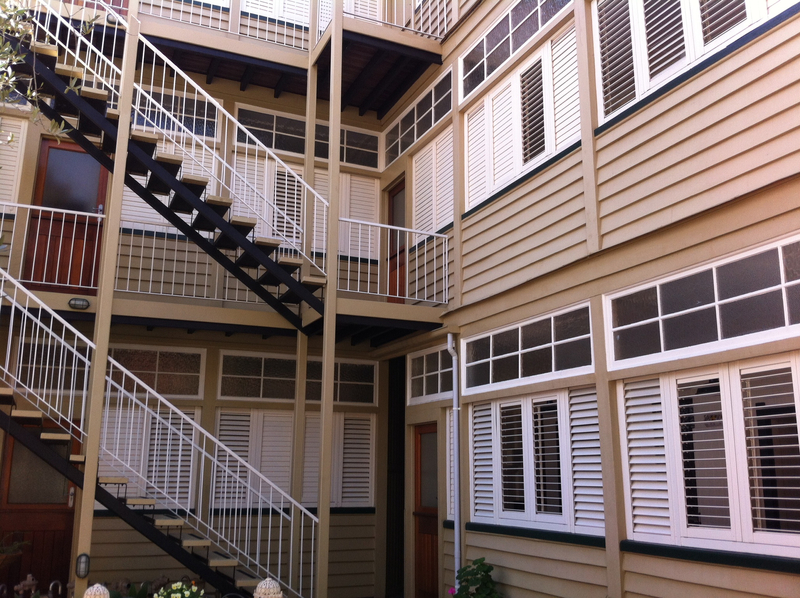 Internally and externally, modern features typical of the Art Deco period grace Coronet Flats and were hailed by The Courier Mail at the time as ‘new to Brisbane’. The facade’s vertical lines are emphasised by ornamental lead light windows which give it a soaring quality. At the same time, the building is structured horizontally and symmetrically around a series of sharply angled walls that fan out in accordian fashion. A good example of the adaptation of an international style to local conditions, these angled walls help to optimise the corner position of the block and were specially designed to bring cool breezes to residents and provide sweeping views of picturesque New Farm Park at their doorstep. Another striking Art Deco feature is the stylised masonry panels which give a low-relief sculptural effect with their geometric patterning. Inside, the building is made up of nine apartments of one to three bedrooms in size. Features such as ceilings and walls treated with simple motifs, terazzo bathroom floors bordered in black, enamel hand basins and Roman baths were singled out as invoking an original modern style. The use of new materials was evident with internal locks made of black bakelite. Fireplaces finished in copper polychrome were reminiscent of international trends. Upon completion, local furniture manufacturer, John Hicks and Co. Ltd, appointed the display flats in an Art Moderne range of bedroom and bathroom suites. The flats were fitted out not only to give the appearance of the modern, but also to support a changing modern lifestyle. At a time when women were becoming more visible in the public sphere, functionality was designed with labour-saving in mind. The kitchen sink, gas stove, bench top and cupboards were built flush against the wall and skirting was fitted in a straight line, with the intention of slowing the build-up of dust. The central refrigeration system that ran independent controls to each flat was much sought after, relegating the meat safe to a thing of the past. The flats were advertised as ‘unsurpassed’, ‘exclusive’ and ‘ultramodern’, and four of nine were let before construction was completed. The time was ripe with a growing middle-class market seeking apartment rentals. A search of contemporaneous newspapers reveals that Coronet Flats soon became a local touchstone of modern living. In January 1938, the Sunday Mail announced that a thoroughly modern ‘Sherry Party After Wedding!’ would be held at the flats to celebrate the marriage of Mr and Mrs Ralph E.D. Hopkinson. One month later, Coronet Flats again graced the social pages, this time hosting a supper party in honour of Miss Jocelyn Growse who was returning to Melbourne. The flat was ‘decorated with pink radiance roses, and roses and tulle puffings in the same shade adorned the supper table’. As far as Max Strickland was concerned, he quickly tired of landlord responsibilities and sold the property to Thomas Maloney for £10,000 in 1939. His full ambition for the building project was never realised, including a second block that would have transformed Coronet Flats into Coronet Court. Fourteen years after selling up and retiring to Surfers’ Paradise, Strickland was tragically killed trying to save his wife Marie who had fallen overboard from a fishing boat off Stradbroke Island. Police speculated he was taken by a shark. Thomas Maloney’s great-grandchildren remain caretakers of Coronet Flats to this day, having sold only three of the apartments to raise capital for the building’s preservation. In 2014 the third of these fetched over $780,000 – a salute to the Art Deco landmark Coronet Flats has become. 1 Other local contractors included: T.Larking – builder and Strickland’s main collaborator; City Joinery Works of Fortitude Valley – responsible for stairs and landings; C.B.Tong of Eagle Junction – plasterer; Melocco Bros. of South Brisbane – bathroom tilers and decorators. 2 Other local suppliers included: Universal Lock and Hardward Co. – doors, windows, wall fittings and lock furnishings; James Hardy and Co. – fibro-cement. ‘Brick flats at New Farm.’ The Brisbane Courier. 21 April 1933, p.5. Calligeros, Marissa. ‘High Demand for New Farm’s Real Estate.’ Brisbane Times. 21 June 2012. 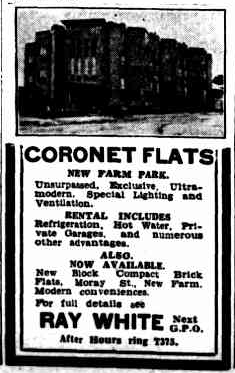 ‘Coronet Court, New Farm.’ Must Do Brisbane website. ‘Coronet Flats. Features new to Brisbane. Strength, Beauty and Dignity.’ The Courier Mail. 17 November 1933, p.5. ‘Coronet Flats: Striking Features.’ The Central Queensland Herald (Rockhampton). 7 December 1933, p.49. ‘Display Advertising.’ The Courier Mail. 17 November 1933, p.5. ‘Display Advertising.’ The Courier Mail. 27 January 1934, p.5. ‘Golden Flowers Bright at Cafe Parties: Gaities in Evening.’ The Courier Mail. 26 February 1938, p.21. ‘Man Drowns Trying to Save His Wife.’ The Sydney Morning Herald. 18 March 1953, p.4. ‘Sherry Party After Wedding! Married Couple’s Future Home As Setting.’ Sunday Mail. 30 January 1938, p.23. Fantastic – have always loved those flats – very beautiful. Loved this Iona! I know this blog is going to have such interesting stories…can’t wait to see what comes next. A lovely post Iona – great writing! I look forward to follow your blog. Great articles. Love your blog. At the other end of the spectrum, when were all those Ashgrove houses with the “Art Deco” facades built – 1930’s? Will follow with great interest, Iona. Thanks Muriel! I think you are right – many of those facades were probably built in the 1930s, perhaps some in the 1940s too at a guess. They are often referred to as “Spanish Mission” Art Deco – the topic of a future blog post I think!